The original LIFELINE™ Tactical Self-Rescue tool is a one-of-a-kind device designed by firefighters to protect firefighters. The concept of the LIFELINE ™ Self-Rescue Tool and Sheath was created by one of our principal owners, James Counsellor (Jay for short). Jay has been a firefighter for the past twenty-two years and is the ex-assistant fire chief of the municipality of Hawthorne, New Jersey. Jay has received several commendations, including the Hawthorne Fire Department Life Saving Award. Several years ago, Jay saw a growing problem in the field with rising numbers of documented instances of firefighters becoming trapped or entangled in wires or cables, for example, when ceilings collapse. The entanglement often occurs in the area of the firefighter’s SCBA. Firefighters have tried to use wire cutters or other types of knives to attempt to free themselves from entanglement situations, but those methods proved unreliable and ineffective. Jay developed the concept of the LIFELINE ™ Tactical Self-Extraction Rescue Tool with the dream of providing each firefighter in this country with a device to help save those that place themselves in harm’s way every day. Extensive engineering collaboration, manufacturing R & D and field testing have resulted in the most highly advanced state-of-the-art cutting instruments ever made. 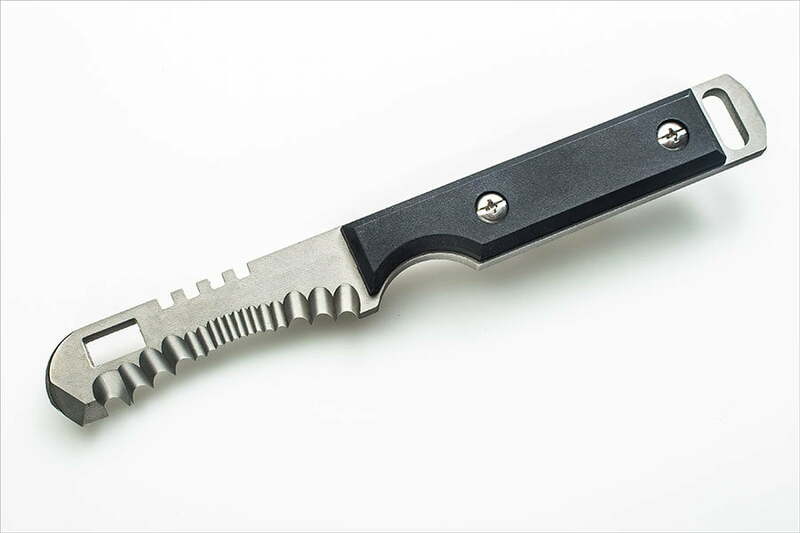 HIGH TECH HEAT TREATMENT: In addition to a highly aggressive patent pending serrated blade, the LIFELINE™ Tactical Self-Rescue Tool manufacturing process includes heat treated to a Rockwell of 59-60, then given a cryogenic treatment which slowly cools the tool in a controlled bath of liquid nitrogen. This highly advanced heat treat process improves the microstructure of the 440c stainless steel, decreases residual stresses and increases toughness and dimensional stability. HEAT RESISTANT HANDLES: The handles on the tool are equally technologically advanced. The base model handles are high-temperature injection molded using DuPont Zytel® Heat Resistant Thermoplastic and have a melting point of approximately 600 °F. The upgraded handles are made of Carbon Fiber-Reinforced Carbon and precision cut by LIFELINE’s CNC routers. The carbon handles have a melting point of 3600 °F and are the same material used on the wings of the Space Shuttle.